I read this novel on the heels of Things Fall Apart, which is set in late nineteenth century Nigeria. Americanah is set in both modern-day Nigeria and America, and it was interesting to read something else about Nigeria, written by a native Nigerian. 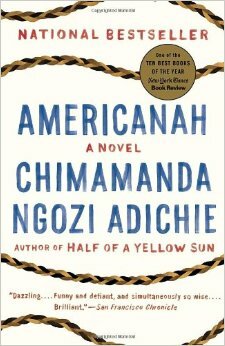 Americanah is about Ifemelu and Obinze, a young woman and man who grow up in Nigeria, meet and fall in love in high school there. They both begin college, and Ifemelu has an opportunity to emigrate to America to finish college. The two plan for Obinze to follow her to America in a year or two, but political turmoil in Nigeria ultimately prevents him from doing so. Upon her arrival in America, Ifemelu is bewildered. For the first time in her life, she must confront what it means to be black in a white nation. She has great difficulty finding a job, and resorts to making money by sordid means to pay her rent and college tuition. Although it is a single incident, that and her feelings of homesickness and alienation result in depression and in her cutting ties with Obinze back in Nigeria. He is heartbroken and mystified by Ifemelu’s sudden silence, which ends up spanning many years. Eventually, Ifemelu secures a position as a nanny to a white family and begins to find her way in this strange country. She starts a blog the centers around her observations of what it means to be a black American from her perspective as a black non-American. Meanwhile, Obinze tries unsuccessfully to get to America. He spends some time in England, arranging for a sham marriage to an English citizen in order to gain citizenship for himself, but is deported back to Nigeria, where he eventually marries and begins to accumulate wealth through questionable means. Through all of this – which spans about fifteen years – Ifemelu and Obinze are never far from each other’s thoughts. A lot of the novel takes place in a hair salon specializing in black hair, as Ifemelu recounts her time in American and plans to return to Nigeria. I never realized how much a part of black culture black hair is until I saw Chris Rock’s Good Hair several years back, and a lot of the hair salon scenes in this book called to mind that documentary. I really enjoyed this novel. It’s very well written and tells an interesting story, as well as offering a slew of observations about race and racism in America. The only criticism I have is that there were a number of holes in the story – relationships and incidents that seemed important but suddenly evaporated without resolution. Still, a very good book.